The benefits of owning commercial property are vast, and even more protracted when you purchase rental properties for sale in Columbus, Ohio. Seated in Franklin County, Columbus is the largest city in the state, and the capital of Ohio. Columbus offers great opportunities for investors looking to buy affordable properties. Buying one or more rental properties means that you’ll have access to a permanent home in a second location (should you choose to live in one of the spaces); most of all, you will also generate profit from it year-round. 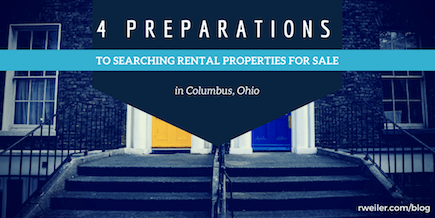 Below are four ways you should prepare before you start searching for rental properties for sale in Columbus, Ohio. In order to have success with rental properties, they need to be profitable; that goes without saying. Working with a financial adviser — or for financially savvy individuals, setting up a spreadsheet or using an app, will help you analyze the costs and gains. Consider how much money you’ll need to spend on electric, water, gas, heat, air conditioning, indoor and outdoor maintenance, advertising costs, etc. Then determine what you can actually charge for long-term or short-term rentals; and perhaps you’ll want your tenants to pay for some or all utilities. Defining your target market for this rental endeavor is important since you want to know which type of rental property to buy. For example, let’s say that you want to market your rental property to young professionals who are just starting their careers. Purchasing a place in or University District would be wise; or choose Downtown Columbus for more mature professionals. If you want your rental property to have a more down-home feel, consider The Arena District; or German Village has a small-town feel. The smaller costs add up, but you also need to set money aside for major repairs on the property. Additionally, you cannot assume that the available spaces will be rented out every month of the year, especially when it comes to rental properties in Columbus, Ohio. NASDAQ’s article, “8 Costs to Consider When Buying a Rental Property” suggests assuming that the property will be vacant for two months out of the year. Using this figure as a guideline will allow you to put the appropriate amount of money aside to cover costs for those months. Know the Columbus real estate market and current rental climate to appropriately estimate the expected vacancy in your area. Essentially, all of these tips help ensure that you obtain the most profit by making the right decision among the many rental properties for sale in Columbus, Ohio. Most people want to look for a property that does not need a lot of repairs, so that money is saved. Choosing updated and upgraded rental properties or multifamily properties for sale also allow you to have a leg up on the competition, in terms of advertising. However, exceptions can exist to these rules. If you are a skilled contractor, then you might save more money to buy a rental property that needs fixing-up; in this case, you can do all of the renovations yourself. Columbus, Ohio rental properties have the opportunity to create a new source of revenue and income. Furthermore, for those of you buying vacation rentals, you’ll have somewhere to go when the living space is not occupied; you’ll be able to vacation more affordably by not having to spend additional funds on hotel rooms. Still, keeping fundamental tips in mind will help you maximize your profit. Want Help Finding Lucrative Rental Properties for Sale in Columbus, Ohio? Are you on the search to find the best commercial rental properties for sale in the area? Contact The Robert Weiler Company at 614-221-4286. With extensive knowledge of the region and nearly 80 years of expertise, we can show you rental properties for sale in Columbus, Ohio that suit your short- and long-term objectives; and ultimately, we’ll help you find the perfect place at the best price.